I managed to get into Google+ some hours ago, thanks to the amazing support of my friends on Twitter and Google Buzz. What I see is overwhelming. It's all I ever wanted from a social network. It has tons of features. But is this enough? I'm absolutely sure, that this is the most sophisticated social network site I ever used. It's clean, it has tons of features, and not even all are implemented yet. Some interesting features that are not so much promoted, but very useful, is e.g. the ability to send files over GTalk. 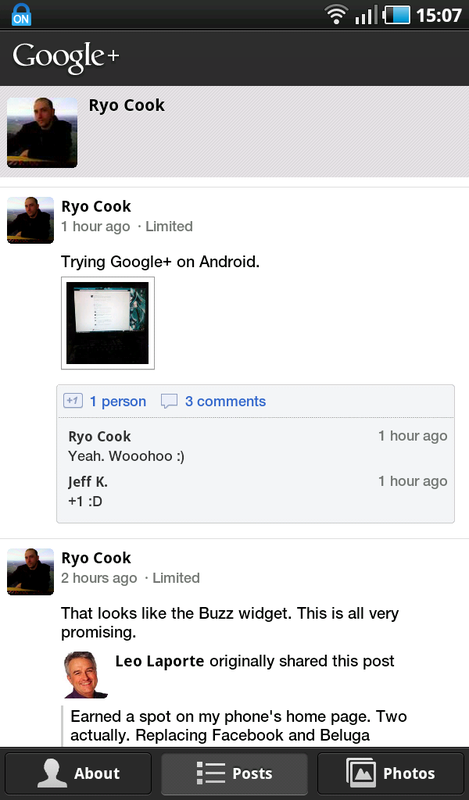 The most interesting feature of the Google+ mobile client for Android for me is certainly the Instant Upload. You can set it to upload any picture or video you take instantly on 3G, or only photos on 3G, or photos&videos only on Wi-Fi. For any Picasa-Web user this is amazing. It will upload to a private folder "Instant Upload". From there you can move it and sort it into another folder. If you share those especially placed photos (Photos from your phone), it will automatically be moved to a "from posts" folder in Picasa. The Circles seems to confuse many people. Everyone can, of course, put anyone in a circle. You'll get a notification about it. That doesn't mean anything. You can choose what you write to what Circle YOU made. If you don't post public, or put this person in one of your own Circle, those people will see nothing from you. And if I write this, new functions are discovered. I never needed so long for such a posting. Another great feature is the way to name people in your Circles in comments or posts. Just type a + and without a space, begin to type the letters of the name you want to add. A drop down box appears and you can choose. 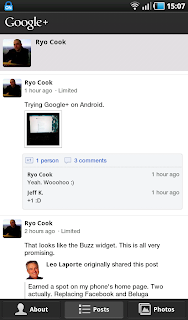 That is really great, and definitely something Buzz-users missed most. Oh yeah, I have to write about Google Buzz, too. An interesting bonus: If you sign up for Google+ pictures up to 2048*2048 and videos up to 15min. does not count toward your storage space. And that is for photos you already uploaded, too. Awesome! I just got back over 3 Gigabyte! Google Takeout also started. You can import and save any of your Picasa, stream or comment data in a .zip file. Looks like they don't want the "Network to rule them all" but the network you want to be. Good move. This gives all the data you post back to you, were it belongs. So this is it, Google's answer to Facebook and Twitter. Well, time will tell, but it has a huge potential. Now they need to add +Games. Many posts rant about. And yes, even if some meant this sarcastic. It IS a important factor. The day Zynga-Games coming to Google+, I know it will be here to stay. However, in this early beginning, there are some glitches. So, don't think Google+ is just now ready for prime-time. That's why Google closed it for more invites. For this first version, it's impressing. Really impressing. But it's all about the people now. I really hope for it.